Tara Whitten flies the Maple Leaf! Tara Whitten did it again, winning the world omnium title for the second consecutive year in a row at the World Track Championships in Apeldorn, the Netherlands. 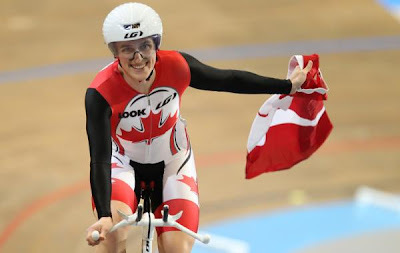 She peaked my interest after winning the omnium/points world title last year, quite an achievement. I never knew much about the gruelling event. Held over two days, six discipline event. There is the flying lap (250 metres), points race, an elimination race, individual pursuit, scratch race and time trial. The cyclist that wins with the least points is crowned world champion and considered the finest overall track rider. Track cyclists are already tough riding up to 85 km/h over the steep banks around 32 degrees. I first watched it when the Commonwealth Games were held in my hometown of Edmonton in 1978. I believe it was the first outdoor track in Canada. Whitten won the gold medal with 23 points, eight points from silver medalist Sarah Hammer of the United States. She won the gold at the 2011 World Cup in Bejing and won four medals (road & track) at the 2010 Commonwealth Games in Delhi. Focus is the key. I discovered that breaks between omnium events can be as short as an hour or as long as three hours. The other positive is that she works with a sports psychologist to help her maintain composure throughout the two days. In 15 months, the omnium will make its track debut at the 2012 Olympics. London's calling for Tara Whitten! My mistake, thank you for the correction. I know I'm not always right track!